Tudor Coman - Not a lot of thought. 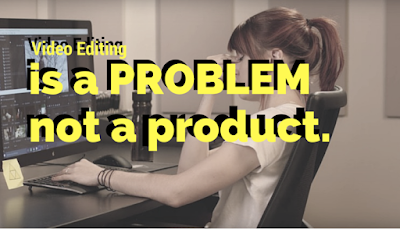 : Video Editing is a Problem, Not a Product. 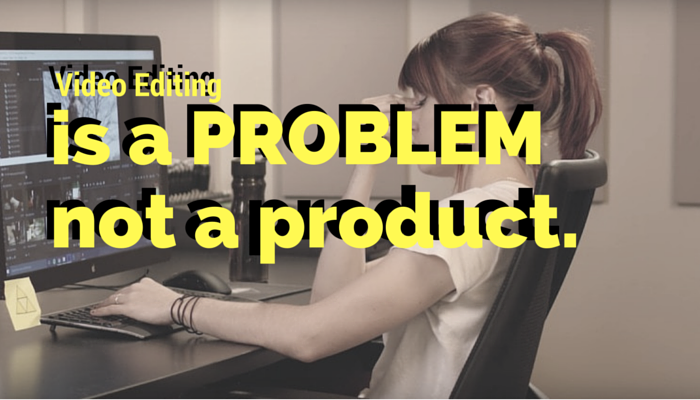 Video Editing is a Problem, Not a Product. Anyone and everyone is talking about how to edit video. From Nick Woodman, the CEO of GoPro to anyone that bought a brand new camera. And they should be. Videos are hot; they have more conversions and create more attention from an audience than any other form of media. Once you see an awesome video, you want to be part of it and share it. Video is trumping pictures in this day and age. However, in order to show some amazing video, you have to edit it. There are over 50 video editing applications out there, ranging from high end Adobe and Sony ones, to free ones, to mobile apps all meant for different maturity levels of editing. Video editing software has been around ever since... well... video. Editing is the barrier between taking video and sharing it. And this is where I see the problem: Everyone perceives video editing, the act of it, as a necessity to sharing an awesome video. Editing is the barrier between taking video and sharing it. However video editing software is concentrating on making it easy to edit video: how can we make it simpler? How can we add more effects? How can we make anyone be able to edit? Well how about we don't? Here's a weird way to think about it - why does the average consumer that just bought a GoPro have to edit their own footage? They don't know what their doing, they don't have time nor creativity. So let's get someone else to do it. Let's get the pros, the people that have the hardware, konwledge, time, patience, creativity to do it. Let's get rid of video editing for the average consumer. That's what we are building at BroPro.Video - It's video editing as a service, Vaas. Imagine, after a day of shooting some radical 1080s on the slopes, you get back home. You plug your gopro in to charge and automatically connects to your home wifi and then our BroCloud. All of your footage is sent to a professional video editor in Serbia and he does what he is good at. You wake up, you check your phone and voila; a fully blown video is there ready to share. For the average consumer, Video editing is a pain point. For the professional Video editing is a product and a profession. BroPro bridges the gap between two markets that want video and benefits both. All software manufacturers in the marketing of their different video editing software programs will be pushing specific features at you. The issue with this is it influences the editing to process significantly more troublesome.